I've been reading up on how to make letter writing more intentional lately and I have to say, a lot of people seem to struggle with it and that gives me hope. Why? If writing a note were as easy as a text or an email, it wouldn't be as special. Tweet that! The fact that we have to take the time out to do it, attaches our effort and care into the very action and that's something our recipient perceives right away. That's why you feel so good when you open your mailbox and there's something other than bills or catalogs. Someone thought you were worth the effort! So putting that same effort into making someone feel that special is something that's not only great to do for someone we love but rewards us in the end too. It feels great to make other people happy, doesn't it? So what is the biggest reason we don't write? You know it... you've said it before and so have I. While this is probably the biggest excuse for not writing, there's weight to it. I'm raising two little boys and I don't have time for almost anything. Simple things that shouldn't be a big deal escape me, so I know what it's like to be too busy. Yet, writing a simple thank you or a quick hello doesn't really have to take that long, does it? We just always think we have something more important to do. THE FIX: Plan ahead. That simple. If turning writing into a habit is important enough, then let's pencil it into our calendars. The nice thing about writing is that 15 minutes will do. You can probably write 2-3 notes in 15 minutes and then you'll feel so much better for having done it. 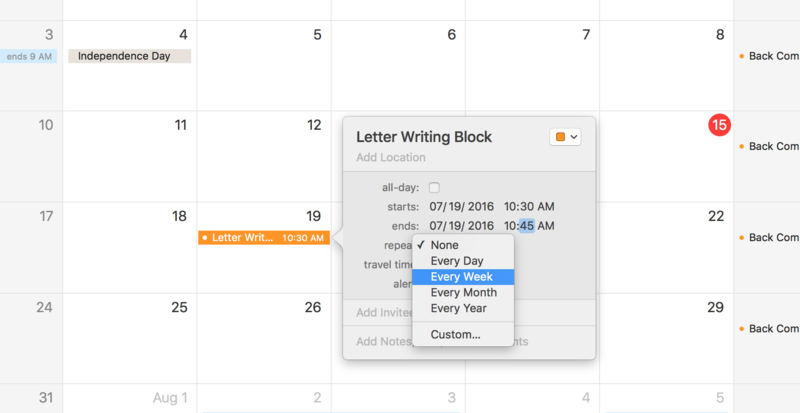 You can set up a Letter Writing Block just like the one I set up in my calendar, that repeats every week and once you get that little alert, stop what you're doing and write a note or two. You know what else? Be smart! If you keep everything you need for writing together, then your 15 minutes will be even better spent. Keep your note cards or personal stationery, your favorite pen or pencil (the one that's buttery smooth and always makes your handwriting look great), envelopes, stamps and maybe even your address book in a pretty box or a special place and when you're ready to write a note, you won't have to scramble to find a note card, a stamp or an address and you'll finish your notes in no time. So although we're busy and we really are, setting the intention to write is the beginning. When we do that, we can take tiny steps to make sure we actually do get to write that one note that might just change one person's entire day. Of course, this is just one easy fix that easily fits into your life, but there are many ways to make the effort. Is there an easy fix that you can implement into your life to make writing to your loved ones more intentional? Let's hear it! We all need some ideas.